Hama, SANA- Army units operating in Hama northern countryside conducted concentrated strikes against positions and fortifications of terrorist groups in retaliation to their breaches of the demilitarised zone agreement in Idleb. SANA’s reporter in Hama said that army units targeted with heavy weapons the positions and fortifications of Jabhat al-Nusra terrorists at the outskirts of Jarjnaz town in the southeastern countryside of Idleb in retaliation for attacks on military positions, inflicting losses upon them. 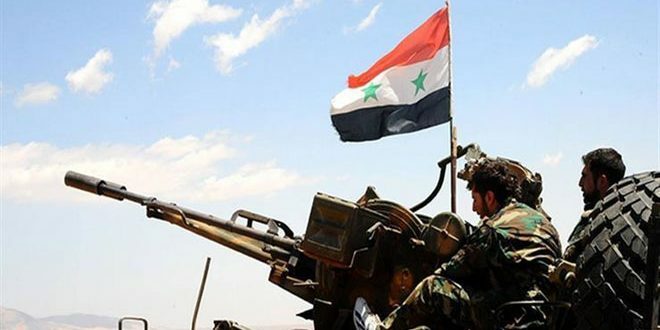 Earlier in the day, the reporter said army units targeted with concentrated fire the positions and bastions of terrorists from the so-called “Turkistani Party” which embraces hundreds of foreign mercenaries in Qastoun village at the al-Ghab Plain, Hama northwestern countryside. Previous Article Happy new year to all our viewers worldwide!